Wanna learn How To Swing a Baseball Bat For Power Like Joey Votto ? One of the biggest problems I had in my late teens as a ballplayer was trying to do too much at the plate. I was trying to get my foot down in time, keep my head still, think positive thoughts, stay short to the ball and have a level swing all at the same time. These were all things that I should be aware of when the time is right, but trying to do them all within one at-bat is insanity. As hitters we have to be willing to focus on the ONE thing that if did successfully would make all the other things trivial. The one element in our swing, approach and training that will provide us with most of the offensive results that we desire. A great place to start is by trusting your abilities and pursuing a more “quite approach”. 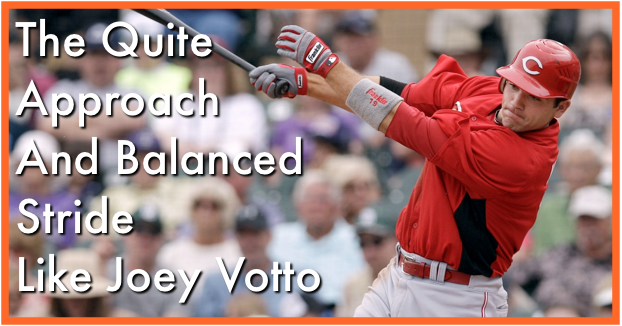 In this AoB swing analysis video, I’ll share with you a few aspects of Joe Votto’s swing that really impresses me. Joey is a bigger guy but swings like a hybrid of a line-drive hitter and a power guy. He’s a great hitter to learn from especially for you lefty hitters! Who’s should we do next? Let me know who’s swing you’d like to see in the next swing analysis video and I’ll be sure to put it in the que. P.S. Want to join a community of players that are taking their game to the next level? Learn how to increase your bat-speed, master advanced pitching and learn from big league baseball scouts about what they look for in future prospect in our online course the Hitting Machine Academy.